Operation Blessing is affiliated and partners with several national agencies in an effort to leverage donor dollars, resources, and expertise with the end goal of providing disaster relief in “real time” to those in need. Our disaster relief team also participates in annual Emergency Management and Federal trainings, including the NIMS (National Incident Management Systems) which is the training required of Emergency Managers on local, state and federal levels. Operation Blessing is a member of National Voluntary Organizations Active in Disaster (National VOAD). National VOAD is the forum where organizations share knowledge and resources throughout the disaster cycle—preparation, response and recovery—to help disaster survivors and their communities. Members of National VOAD form a coalition of nonprofit organizations that respond to disasters as part of their overall mission. Operation Blessing serves as a support agency of the Florida State Emergency Response Team (SERT). OBI is part of Emergency Support Function #15 (ESF-15), which is categorized under Volunteers and Donations. 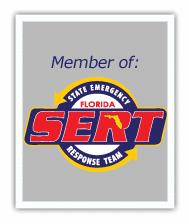 There are 17 Emergency Support Functions that make up Florida SERT in order to allow for preparedness and prompt response during a developing event.